Mixing fluids can be very important in the design of miniaturized chemical and biochemical analysis systems. However, the mixing of fluids at the micro-scale is challenging because of an inherent lack of any mechanism to induce the mixing. Turbulence is a good natural way to cause mixing, but microfluidic processes are laminar in nature. 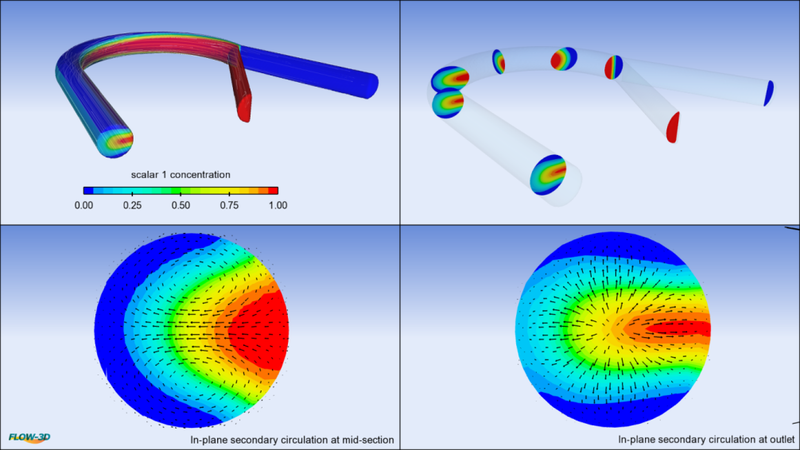 In this blog, I will talk about the challenges that arise because of the laminar flow regime and ways to overcome those challenges when designing micromixing devices. Mixing can be induced by changing the geometry of the channels through which the fluids flow. One such geometric modification to the fluid channels is to apply curvature to the channels as shown above. As the fluid passes through the curvature, the centrifugal force comes into play. As a consequence of the interplay between inertial, viscous and centrifugal forces, mixing may be triggered in the channel. This approach can be easily integrated in a variety of lab-on-chip systems. Microfluidic mixing processes have low Reynolds numbers and high Peclet numbers. The Reynolds number is the ratio of inertial to viscous forces and the Peclet number is the ratio of inertial to diffusive forces. The large difference in inertial and diffusive forces means that the fluids have to travel long distances in order to get mixed. Now, the long distances here might be just a few centimeters, but that is relatively massive compared to the micro scale at which these devices operate, defeating the purpose of miniaturization. The channel length in the device shown above is only about 0.2 cm. There are two primary ways to overcome the constraint – active and passive. An external input of energy can be applied to agitate the laminar microfluidic flow in the form of turbulence, mechanical, electrical or thermal. This is an active approach. The other less-destructive or gentler approach is to modify the device’s geometry. This is a passive approach, which is desirable in applications involving sensitive biological samples. In this case study I will talk about a passive strategy to induce mixing. The Dean number expresses the relative magnitudes of inertial and centrifugal forces to viscous forces. Under an appropriate value of Dean number, a radial pressure gradient may be established to generate a transverse flow field in the microchannel. The setup shown above is run with two different values of Dean numbers and the results are shown in the images below. Different viscosities are used in the two cases, which changes the Reynolds number, which in turn changes the Dean number. Notice the formation of multiple vortices as the fluids turn at the channel curvature. The transverse flow forms the counter-rotating vortices at the top and the bottom. These vortices formed in one fluid visibly engulf the second fluid (animation below), causing increased surface area for interaction between the fluids. The vortices are basically transporting fluid from the inner wall to the outer wall of the microchannel. The transport is so significant that it almost completely reverses the location of fluid from the inner wall to the outer wall. Multiple curvatures can be used to break the fluid filaments further, increasing the area of interaction even more. The animation below shows the entire mixing process for the case with high Dean Number. As demonstrated, the goal of achieving a gentle passive micromixing in a shorter length can be achieved using a curved microchannel. 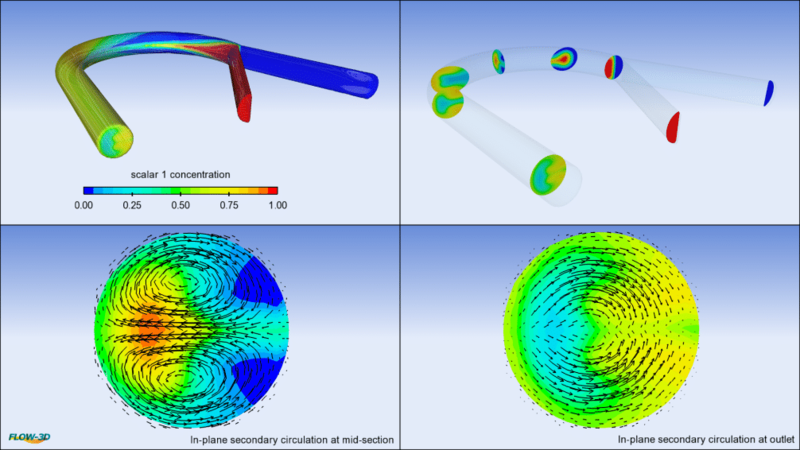 FLOW-3D’s viscosity models can be effectively and easily used to study such problems involving secondary flows, multiple vortices and complex flow patterns. 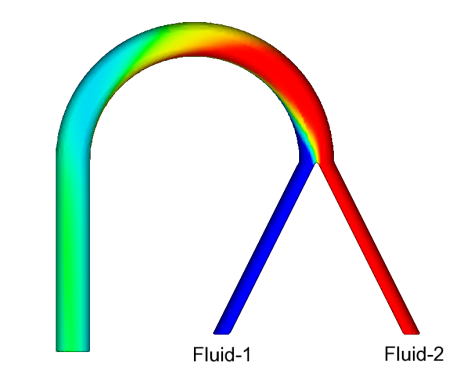 Check out our webinar on Microfluidics Flow Modeling on demand for more information.